"I was shocked, as were all who knew him. It was another great professional I worked with in Newcastle and a great person. It's a sad outcome." "Gary was a magnificent person, bright, fun and a wonderful family man - he lit up every room he walked into. I am proud to have been his friend and will miss him dreadfully." "I am shocked and devastated at the news. Gary was a great friend, the ultimate professional and will be sorely missed by everyone. Our thoughts are with his family." “He wasn’t just a great player, he was a great person too. He was always great to be around, the life and soul of the party, and a good friend - it's a sad, sad day." "Gary was a very close friend and colleague of mine and I am absolutely shattered by the news, it is totally devastating. "When I was coaching at Newcastle with Sir Bobby, Gary was as perfect a professional as you could ever wish to work with - 100 per cent committed, dedicated to his profession and, above all, a wonderful colleague and friend. "I worked with him at Sheffield United too and of course was delighted to see the fantastic job he was doing with Wales. "I am devastated by the news and I can only offer his family the most sincere of condolences at this tragic time. Gary was an exceptional person and a very dear friend. Football has lost a truly great man." "It’s just a massive shock. I don’t think anyone saw it coming, certainly I didn’t, and people who worked with him on Football Focus said he was in good spirits. “I played against Gary many times and I played with him for a couple of years at Newcastle. He was the sort of guy who would make you very welcome and help you out. He taught me how to play the guitar when I was there. “I spoke to him a couple of months ago and whenever I saw him I would always ask him about his family. Obviously my thoughts go out to them now. “He was just the ultimate professional and no-one ever had a bad word to say about him. As someone who was younger than me the news is a huge shock. I’m just trying to soak it in. "When people talk about him today, they are all saying what a good guy he was. He was obviously a great player, you don't achieve what he did without the exceptional professionalism he had. But more so, as a man he carried modesty around with him, he was very successful in his business. "He was just a top bloke, it's as simple as that, and it's very, very, very sad. He's someone I always had the utmost respect for as a man, as a football player. Everyone had nothing but positive things to say about him, and rightly so." "The board, manager, staff and players of Newcastle United FC are today deeply saddened to learn of the tragic death of Gary Speed. 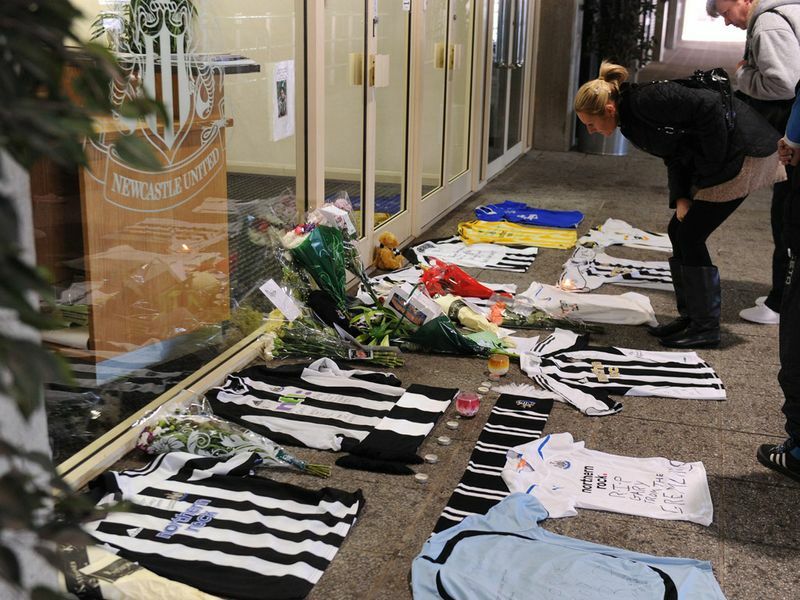 "Gary was an inspirational and much-loved player at Newcastle United during his time with the club from 1998 to 2004, making 285 appearances and scoring 40 goals. He was an excellent servant to the club, the ultimate professional, and an exceptional role-model for younger players. "Gary will be deeply missed by everyone at Newcastle United. Our condolences go out to his family at this very sad time." "Gary was a really great guy who joined the club the year before I made my debut. I looked up to likes of Gary and Alan Shearer, and he was always there for me and the rest of the young lads, taking time to talk to us at training and pass on little tips that helped you improve as a player. Not everyone would do that so it just goes to show what a class act he was. "He taught me so much, not just on the field, but how to handle yourself off the pitch too. I wish his family all the very best at this terribly sad time." "This is one of the saddest days in football, when we hear a colleague as respected as Gary is tragically no longer with us. "A top class international player whose seamless move into national team management tells us everything you need to know about him. He had great class on and off the pitch, he was a man of true character that so many people looked up to. "It is so sad and tonight my thoughts are of course with his family." "He was a special guy, I was very close to him. He was a pretty strong character in the dressing room, especially when you had a bad game – he would give you a lift. “He was a second captain after Alan Shearer. He was a great professional, giving everything in training day by day. He was an excellent leader and an excellent team-mate. It’s a sad day for football and especially for people who knew him. "Whatever people's opinions are on how good he was as a footballer, he was an even better person. He was one of the best footballers I played against - a man that did everything to the best of his ability and would do anything to be the best. "It is hard to put into words what he was like as a person - you couldn't compare him. He was the best." "He was one of the nice guys of football and as I don't know anyone who had a bad word to say about him. He was a gem person and a very, very good footballer. Away from football he was a wonderful family man - to lose him is unbelievable. "I heard the tragic news on the coach down to Charlton yesterday and I felt completely numb. I immediately phoned my wife as we are very close to his family and have spent time away from the football field together. "It is devastating news, Gary was an unbelievable football man whether he was playing, coaching or managing. He was completely dedicated and loved the game. "Away from the field he was a great person and very much a family man. My thoughts, as are those of my family, are with his wife and his two children." “He was a brilliant professional and when I was at Newcastle he would always be available to help you out and offer you some advice if you needed it. “He was such a professional and so many people looked up to him. For the time that I knew him, and I've met up with him since leaving Newcastle, he was always so kind and just a really nice person. "It was just a shock, a total shock. It is difficult to come to terms with. It seems so out-of-character for someone like that to do something like that. He was such a strong character, fun-loving and a leader. "As a man and as a professional, he had every quality that you would want to be a top-level player and that is why he was the success that he was. He had a hell of a lot of talent, and he maximised it through his professionalism. "He was the type of guy that you would want to be. He was full of stories, a funny guy and a leader of men. If you went out for a drink or were in a group, he would be the one leading the banter. He was a really intelligent guy, hard-working and always looking to improve himself. "No-one ever spoke badly of Speedo - you couldn't. He was a strong-minded character, but spoke with a real level-headedness.... it is so sad, it's unbelievable." "I came up through the ranks at Newcastle and Speedo was a big character there. The young lads like me used to train with the senior pros quite often and Speedo was always the life and soul of the Club. "He was a great bloke - one of a kind - and especially good with the younger lads like me at the time. He was always very supportive to us all. He would always encourage us. He was an absolute gentleman - on and off the park - and I still can't quite believe it. "The way he conducted himself in any circumstance was unbelievable. He was a credit to himself, his family and the game in general. The world of football has lost one of the really good guys." "He was a smashing lad and was really well respected. We don’t know the circumstances and there’ll be a lot of people who are saddened at what’s happened, but I think the most important people at this particular moment in time is his wife and kids – they must be absolutely devastated. "It’s a times like this that the football becomes a wee bit irrelevant. He was a very respected man in and around football." "You can call someone a great player if they've played for so long and won things. Some people are called great players after one season, but for me if you play for such a long time, it shows your character." "I was fortunate to take Gary to Bolton. At that stage he was a young 34 and most people were saying he was getting past it, but in actual fact his stats were absolutely outstanding. "As soon as he walked into the club he had an aura. He did everything to detail. When generally an old professional might moan and groan and say 'I don't want to do this' he just took it on board. "I was also fortunate to get to know him as a person. He was an outstanding individual and this is what's devastating. "His life was about standards, he had a high standard for everything that he did. To sum it up, if you had a daughter and she brought Gary Speed home you'd be delighted." "What can you say about Gary that hasn't already been said? I was fortunate to have worked with him. At that time, Sir Bobby gave me free licence to train the side when we were working to turn the club around. "It was a difficult period for the club, but players like Gary Speed, Robert Lee, Alan Shearer, Shay Given, Steve Harper and Warren Barton, they were really important people in getting the club going again and Gary was a key member of that group. "He was totally dependable, totally - his attitude to training, playing and learning and he also had a great will to win. He was the absolute model professional."